For some it is truly important to be relatable to others, or at least to find people they can personally relate to. Lacking this connecting and relatability can be upsetting and even feel a bit lonely at times. 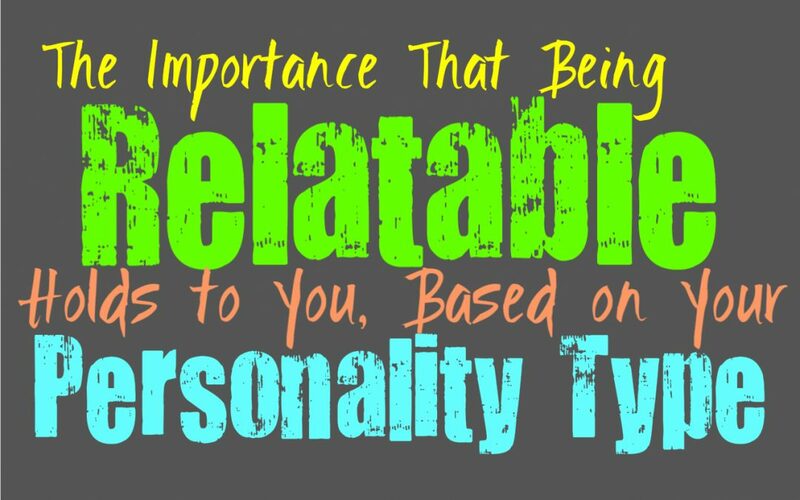 Here is how important being relatable is to you, based on your personality type. INFJs do want to be someone that others can relate to, but at the same time they can struggle to relate to others. They have parts of their personality which can make them rather relatable, and yet the deeper parts can be hard for others to connect with. INFJs want to find someone to connect with and relate to, but it isn’t something they require on a larger scale. For the INFJ it is more about finding at least one person they can bond with, someone who actually understands them and relates to them on a deeper and more sincere level. ENFJs definitely want to be relatable to others, since they want to be someone people can come to when they are struggling. They want to be someone that others will relate to, and they also want to share that same sentiment with their loved ones. ENFJs don’t like being un-relatable, at least not with the things that matter. They know there are parts of their personality which make them different from others, but that doesn’t mean they have to be someone others cannot relate to. ENFJs strive to find ways to connect with everyone, and want to be someone people feel understand because of. INFPs might care about finding people they can relate to, but they don’t need to be relatable to everyone. INFPs don’t want to be someone that the whole world can relate to, since to them it means they are boring and insincere. They do want to find special people who they feel connected to in a way that is honest and relatable. INFPs crave a connection where they feel understood in a more relatable way, but they don’t need it from a lot of people. They don’t usually feel like someone others can easily relate to, since their way of looking at the world is often rather unique. ENFPs don’t need to be relatable, as long as people admire and accept them. Having people enjoy their presence is often more than enough, since they realize they are unique and sometimes unusual people. ENFPs don’t find it easy to relate to people, and so they understand that most people with feel the same about them. They do however, want to find people who can at least understand them and accept them completely for who they are. They want an unconditional connection, one that can last for a long time. INTJs don’t really need to be someone that others can relate to, since most of the time they feel a bit unusual. INTJs don’t feel a need to be someone others can relate to, nor do they need to constantly search for this amongst others. INTJs understand that relating to people isn’t as important as respecting and appreciating them. They do want to find people who can understand them to some extent, and appreciate their similarities and differences. They don’t need to constantly be relatable, they just want to be able to connect with their loved ones in an honest way. ENTJs don’t really need to be relatable, unless it is in a setting where this will benefit them. They don’t necessarily need to be around people who can relate to them, as long as those people respect them. ENTJs understand that they have unique personalities, and that they have a way of going after things that most people can’t entirely relate to. While ENTJs might not require a relatable personality, they don’t want to be someone that others can look up to and appreciate. They want their loved ones to connect with them and in the very least respect them. INTPs don’t really feel like being relatable to others is possible, since they often feel a bit alien to most people. INTPs don’t find it easy to relate to most people and so they often feel misunderstood. While they might not feel a strong desire to be someone most people can relate to, there is a part of them that is searching for this. INTPs don’t often want relatability on a larger scale, but they want to find someone that can understand and appreciate them for who they are. They do crave finding someone they can relate to and connect with on a deeper level. ENTPs often realize that being relatable isn’t something that comes naturally for them, since they have rather unique personalities. Their complex inner minds can be something that sets them apart, and they are often more than okay with that. For the ENTP it is more about being someone others can admire and be proud of, or in the very least enjoy spending time with. ENTPs might want to find someone special who can understand them and appreciate them for who they are, but this isn’t something they just expect to find easily. ISTJs do want to be relatable to some extent, and enjoy being someone that others can understand and respect. They don’t need to feel like someone who is unusual and outside of the being relatable. ISTJs value making connections and want to be a valued member of their community. For them being able to be someone others can relate to is actually a good way to make connections that will help them move forward in life. While it isn’t vital for them to constantly be relatable, it is a helpful part of getting things done how they want. ESTJs do enjoy being relatable, especially since they want to be someone others can understand and respect. ESTJs value efficiency and do their best to get things done, and in some cases this requires working with others. They believe it is important to be someone that others can relate to, since being a valuable member of their community is truly something ESTJs strive for. If ESTJs cannot always be relatable, they at least want to be someone others can respect. ISFJs actually do want to be someone others can relate to, since they value making connections. They want to be someone that people can connect with and come to when they are in need. ISFJs also want to be a valued member of their community and family, and do their best to make this happen. For the ISFJ being relatable and finding people they can relate to, is truly an important things. They care about people and because of that they do strive for relatability. ESTJs definitely want to be relatable people, since they believe it is important that others can come to them. They want to be someone that others can rely on, and so being relatable is something they strive for. ESFJs want to be able to relate to people on a deeper level, and so they try to find ways to connect with them. Their sense of empathy often helps the ESFJ be very relatable, even in situations where it would be difficult for most. ISTPs don’t really value being relatable all that much, especially on a larger scale. They don’t want to force anything, and so they don’t need to be relatable to everyone they meet. ISTPs do care about finding people they can connect with, but relating isn’t always vital. For the ISTP it is more important to be understood and appreciate, even for the differences they might have with someone. ISTPs realize that they can’t always relate to people, but they do believe it is important to respect one another. ESTPs do like being relatable to some extent, at least enough for others to enjoy their presence. They like having some qualities which set them apart, but at the same time they strive to make connections. ESTPs want to find loved ones who can relate to them, and they want to feel understood on a deeper level. They don’t believe it is vital to be someone that can relate to everyone, and they enjoy having differences in some situations. ISFPs do believe that being relatable is important, even if they struggle to really find it. They know that there are times when their unique qualities can make them hard to relate to, but they want to find at least one person who can truly understand them. For the ISFP it isn’t about being relatable on a larger scale, it is more important to find someone special who can connect with them and appreciate them for all that they are. ESFPs do want to be relatable, and enjoy being able to connect with people. They want to find people who can understand them and relate to them on a deeper level. For the ESFP being relatable is actually truly valuable, since they don’t want to struggle to be understood. They especially want to be someone that their loved ones can understand and relate to, at least with the more important things in life. ESFPs realize they have an unusual side, but they want to find people who enjoy this part of them.